Tarbiyah students enjoy their time in the garden and help to create their own green space! Pictures will be up soon to show you the before and after of our wonderful garden, which includes a new rain barrel to help our thirsty plants this summer! With plans already underway for our next garden, we are optimistic and hoping for the same reaction from our students at Christ the King Secondary School in Georgetown. Stay tuned to see what projects we’re working on! Follow us on Instagram and Twitter at @GSSHaltonPeel. See you next time in the garden! This article originally appeared on Faith and the Common Good on June 26th, 2017. Imams in Toronto joined the worldwide Green Khutba Campaign on Earth Day and delivered sermons to raise awareness on the environmental challenges facing humanity. This article appeared on Iqra.ca on April 22nd, 2016. TORONTO, April 11, 2016 - Muslims across the world will commemorate Earth Day on Friday, April 22nd, 2016 with the Green Khutbah Campaign as religious leaders deliver a sermon to raise awareness on the environmental challenges facing humanity. This year, 2015, is a watershed year for the climate movement. In December governments will converge in Paris where they are expected to forge a new, international climate agreement that is robust, ambitious and comensurate with the scientific imperatives outlined by the Intergovernmental Panel on Climate Change. We believe that their ambition has to be driven by a bigger, broader and stronger citizens’ movement. Faith communities increasingly recognise that the climate crisis is also a moral crisis. The adverse impacts of climate change that we have witnessed so far, present a clear case for people of faith to examine the underlying moral causes of this phenomenon. It prompts faith communities to take action to halt the desecration of nature that leads to destruction of creation, human and otherwise. Furthermore this is an opportunity for faith communities to provide a vision, inspire others and lead the way in building a fairer, safer, cleaner world built on renewable energy – leading the way on a journey to an economic system that meets development goals and is also spiritually fulfilling. The Islamic faith community represents a significant section of the global population and certainly, can be influential in the discourse on climate change. TORONTO, March 16, 2015 - Muslims across the world will commemorate Earth Day on Friday, April 24th, 2015, with the ‘Green Khutbah Campaign’ as religious leaders deliver a sermon to raise awareness on the environmental challenges facing humanity. The ‘Green Khutbah Campaign’ commemorates Earth Day that will take place on Wednesday, April 22. Environmental concern around the world is on the wane, according to the GlobeScan global poll that tracked public concern on six environmental issues. An extensive online resource has been created by Khaleafa.com (www.Khaleafa.com/greenkhutbah) to support the ‘Green Khutbah Campaign’ and Islamic organizations and well-known leaders are throwing their support behind the initiative. Parliament Chair Imam Abdul Malik Mujahid commits to ensuring that the forthcoming 2015 Parliament of the World’s Religions in Salt Lake City, Utah, will make sustainable living a primary focus. 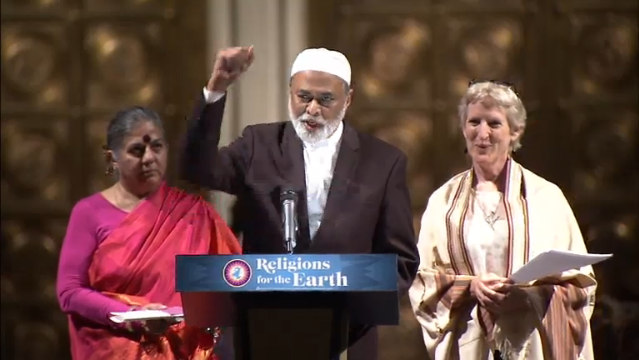 Imam Mujahid speaks here at the Religions for the Earth MultiFaith Service held September 21, International Day of Peace, at Cathedral Church of St. John the Divine in New York City. Nearly half a million people marched to save the only planet we have on the 21st of September at the People’s Climate March in New York City. After exceeding goals to stage the biggest climate march in history, the day ended with an interfaith service packing thousands into the largest Cathedral in the World, St. John the Divine. Leaders spanning the faith traditions of the world vowed there to commit unprecedented action to curb climate change. 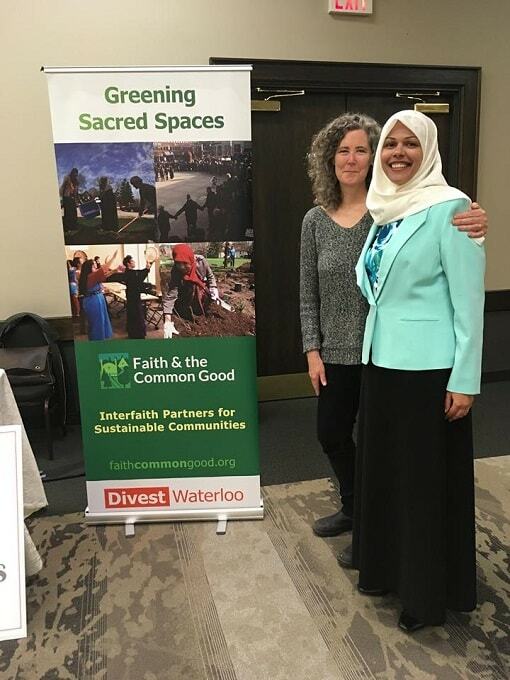 In this historic moment the Parliament, in conjunction with partners Green Faith and Interfaith Center of New York, took part in the 3-day Religions for the Earth conference presented by Union Theological Seminary. Organized by Union Forum’s Karenna Gore, daughter of Former U.S. Vice-President and global environmental champion Al Gore, the conference that brought together more than 200 leaders of world spiritual communities and interfaith organizations also leveraged partnerships with the World Council of Churches, Religions for Peace, the Jewish Theological Seminary, and the National Religious Partnership. Months of planning and organizing- with Parliament Trustee Dr. Kusumita Pedersen at the core and Trustee John Pawlikowski advising- resulted in a great showing of support from the Parliament Board. Highlighting some of the ways that spirituality as a healing, connecting, and educational force can powerfully address the climate crisis were Rev. Andras Corban Arthen of the Earth Spirit community, who spoke on an Indigenous Peoples panel, Rev. Dr. Anne Benvenuti, author and educator, who discussed the spiritual connection of humans and other animals, and Phyllis Curott, attorney and Wiccan priestess, who led an opening session prayer. Parliament Trustee Emeritus Naresh Jain, who serves currently on the Parliament’s UN Task Force, was also in attendance. The Parliament’s Executive Director, Dr. Mary Nelson, connected with former Vice President Al Gore, as did Parliament Chair, Imam Abdul Malik Mujahid, who spoke at the closing Multi-faith Service. What amplifies the voices of faith communities today is hoped to carry over into massive action at the forthcoming 2015 Parliament. Speaking to the Multi-faith Service at the Cathedral of St. John the Divine on the evening of September 21, Imam Abdul Malik Mujahid made a public commitment that the 2015 Parliament will take on climate issues and sustainable living as a prime focus. Press Release: British Muslims went green this Saturday, 6th September, as Muslims from all over London took part in a 100km cycle ride from Mosque to Mosque. Muslims pray 5 times a day from dawn till dusk, and each ‘Salah’ prayer constituted a different stop at some of London’s most iconic houses of worship, from the East London Mosque, all the way to the al Manar Mosque in West London. The ‘Tour de Salah’ challenge, organized by MADE in Europe, forms part of a wider campaign called ‘Green Up My Community’ supported by the City Bridge Trust and aimed at increasing awareness of environmental issues, as well as sustainable practice within the Muslim community. MADE is a grassroots organisation serving to empower young Muslims to make change within their communities, through campaigns and education. The Green Up Campaign is targeted towards Mosques, promoting awareness of climate change and its effects, as well as working with the Mosques to become beacons of environmental justice through efficient waste management and water and energy consumption. 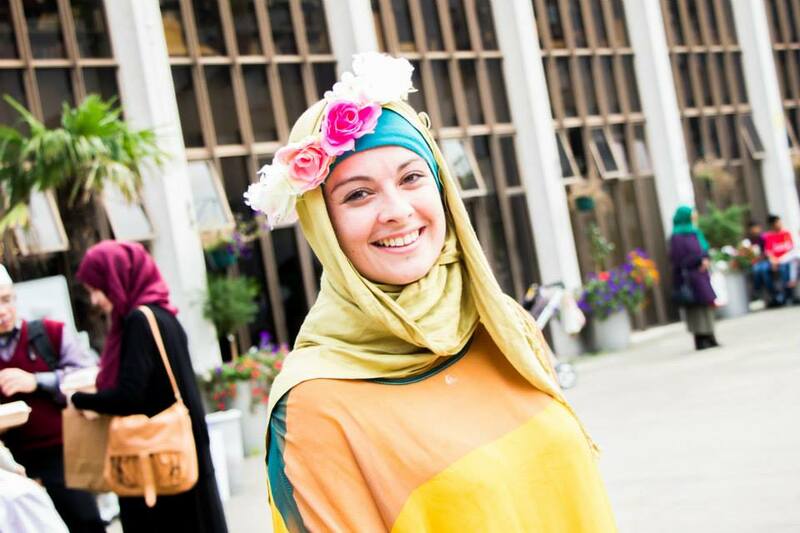 One of the Mosques looking to take an active role on the issue is the London Central Mosque in Regents Park, which co-hosted the first Muslim-led Eco Fair with MADE. As the third ‘Salah’ stop on the map, this was an opportunity for people of all ages, family and friends, Muslims and non- Muslims, to gather for a day of fun and activities, and learn something new about the environment that we all share. With Mosques like Harrow Central, Kingston Muslim Association and the Palmers Green Mosque taking an active part in the cycling challenge, the future looks promising as more follow suit. Environmental sustainability has become a topic of great urgency in the last few decades, and was cited as ‘one of the most serious threats we face’ by Prime Minister David Cameron. In the latest report by the UN, the effects of global warming were dubbed to be ‘severe, pervasive and irreversible’. UN General Secretary Ban Ki Moon has called world leaders to mobilise on September 23rd to discuss their commitment to reducing carbon emissions. On September 21st, people from different walks of life all over the world, including London, will be taking part in a ‘Climate March’ to demonstrate to their respective governments just how seriously they want their leadership to respond to this imminent threat. “To some extent, it is understandable that the Muslim community is not leading the Environmental movement simply because the Muslim world in the modern era wasn’t at the forefront of damaging it,” comments prominent Muslim theologian, Sheikh Shams. “However, now that we are aware of the issue, given what our deen (religion) teaches us, given the teachings of our Prophet, we need to quickly catch up and get to the forefront because our rightful position is to be leading on all issues of preserving the environment,” he adds. The Eco Fair boasted a range of activities and businesses, ranging from the pedal-your-own-smoothie bike, to organic and eco-friendly soaps and cosmetics, to Fairtrade cakes, solar-powered phone chargers, and upcycling workshops. The Imam of the Mosque, along with Sheikh Shams who was also cycling the whole leg, both stressed the importance of environmental activism. For many attendees, it was refreshing to see an initiative like this coming straight from within the Mosques. “I think this is a much needed event in the Muslim community, because environment and sustainability are among the key principles in Islam yet the average Muslim probably doesn’t think too much about it,“ remarks Mikhail, a Science teacher from Leicester. “I never realized how much of a contribution bottled water actually has on the environment. Since coming here, I’ve just been thinking that we need to make a change,” commented David Tsan, one of the cyclists upon arriving at the Fair. As the threat of global warming increases by the day, such initiatives are a welcome effort and a call for further action from both the faith and non-faith communities to stand united in preserving our planet. 1. MADE in Europe is a UK-registered charity which works to mobilise young Muslims to take action against global poverty through volunteering, campaigning and education. For more info seewww.madeineurope.org.uk.